e90 proper sized drain plug on the passenger side for an automatic?? BMW 3-Series (E90 E92) Forum > E90 / E92 / E93 3-series Technical Forums > Mechanical Maintenance: Break-in / Oil & Fluids / Servicing / Warranty > e90 proper sized drain plug on the passenger side for an automatic?? Hey I was wondering if someone could verify for me the proper sized drain plug for a radiator that has two drain plugs, I am aware that some e90s have 1 plug others have 2. I have a 2006 e90 325i automatic. My OEM radiator had only one long drain plug on the driver side. However the replacement Nissens radiator has two drain plugs, one on the driver side and the other on the passenger side. I attached a pic of the directions for the Nissens radiator, my confusion is because the directions say that the radiator came with the proper plug already installed (the long plug on the driver side). However I had a leak from both plugs so I removed them, and saw that the passenger side plug is a short one. From the directions it looks like there should be a short plug in the passenger side for gasoline cars, you can see that in the picture. But when I checked realoem, they list the long plug as being used on both sides for the automatic. I called pelican parts but I think they just looked at realoem, and didn’t seem entirely confident about what they were telling me. I just don’t want to obstruct something and inadvertently cause an overheating situation, can someone with an automatic car and two drain plugs please clear up for me. Long or short plug for the passenger side Thanks! 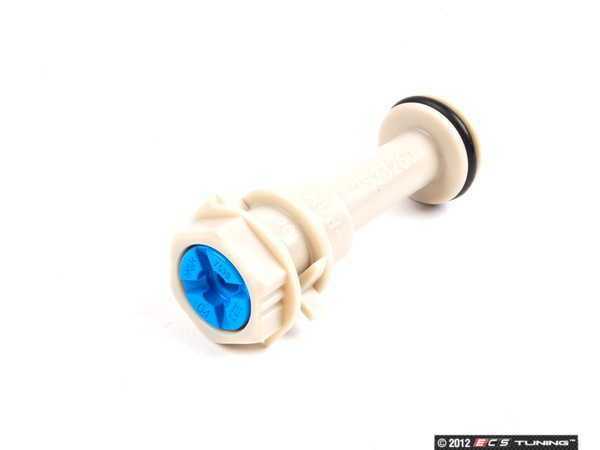 This is the longer drain plug/tube with the double orings, I did use this for the drivers side, but I still remain unclear if this longer tube is also what should be used on the passenger side. this shorter tube was on the passenger side, as per directions I am led to believe I should be using this shorter tube, however realoem lists both drain plugs for automatic cars as the longer version pictured above. has anyone removed this thing from the passenger side on their car? I think Nissens radiator for automatic already comes with both plugs pre-installed and the radiator is shipped with one of each drain plug in the package separately in a bag. The driver side has the long plug installed and the passenger side the short one. At least that's what the instruction says. Driver side - I think for auto one should leave it as is (because package says long one is already installed) but for manual one should swap it with the shorter one. Passenger side - I think it comes with the shorter one pre-installed (I don't know why) but everyone should swap it with the longer one. Can anybody confirm this? Thanks. I'm replacing a factory radiator in a 2006 xi w/ Automatic transmission w/ after-market and have exactly the same question as has been raised here. I'm in agreement that the left (USA Driver) side should get a long plug. But what about the right side? If I put a short plug in it seems to eliminate any coolant flow through the nearby fitting. That seems wrong, but the vendor (whom I don't really trust) says the short one is fine. My mechanic told me my E90 is fitted with both the long type, its an auto. Thanks for the reply. So the long plug on both sides. That's what I believe is correct. Just to finish off this thread, the radiator I got was the p/n 2882 that is sold all over eBay for less than $100. It comes with NO plugs installed, just a short and long one in a bag. Problem is, consistent with what is indicated above, a 2006 xi with automatic transmission requires TWO LONG plugs - one in each of the fittings - same as the factory radiator. After going back and fourth with the vendor, they finally relented and sent me another long plug. All is installed now and the car is back on the road. But I can't believe nobody else has even run into this issue, given how failure-prone the radiator is and the number of these cars sold. This is a helpful thread, but i am wondering how to actually change this drain assembly. It does not thread in/out, and i do not want to break it. Can someone inform as to how to change the drain assembly?